Written by tevensso on May 11, 2009 to Live and Per Gessle. STOCKHOLM (Updated) - It's Stockholm Day 2: the same show, the same songs, the same band, the same fans (well, almost) - but twice the energy. What can I say… this band is among the tightest I've heard since I don't know, Gyllene Tider 1996? [Well, Bon Jovi 2003 was pretty damn amazing too, in front of 68,000 people.] Was everything "just the same?" Not at all. There was no video crew, despite previous information, and most of all… Marie Fredriksson on guest vocals! Marie, as in Amsterdam, sang "It Must Have Been Love" and "The Look" together with Per and the band. The noise when Per introduced Marie must have made an impact on the Richter scale… or, as a reporter for one of the Swedish newspapers put it, it almost blew the roof off the theater. Fans cried openly. Erik Johansson, who we mentioned in yesterday's article, said he hasn't cried this much ever. Marie herself looked quite taken with the situation, and just as in Amsterdam… couldn't help but say "Wow!" The concert was basically the same as on Saturday, only — so it seemed to this reviewer — much more intense. When The Daily Roxette talked to Per after the show, he said the band cried backstage, and now they feel all empty inside. But things are in the works "soon," Per said without being specific at all. Even though most of the antics of the band are rehearsed, it's still kind of fun and cute… especially when Christoffer starts playing "Ljudet av ett annat hjärta" frantically on his golden Gibson/Epiphone, or starts the intro to "Owner of a Lonely Heart" in "Do You Wanna…"
TDR can also namedrop some of the event's guests; Her Royal Highness Crown Princess Victoria with fiancé Daniel Westling (with stern Secret Service agents hovering,) Swedish singer Lena Philipsson ("Kärleken är evig" etc.) and famous movie and music video director Jonas Åkerlund… just to name a few. Written by tevensso on May 10, 2009 to Live and Per Gessle. STOCKHOLM (Updated) - Spring is certainly in the air as the fans start lining up outside Cirkus in Stockholm. "Super fan" Erik Johansson has been there since the night before and is first in line — again. He feels it's his duty. When this reporter arrives at around 4:30 pm, there's quite a few people there already. Cirkus runs a very tight ship and everyone there has a number on their hands, and these numbers are checked regularly. The mood is nice and the video crew interviews people here and there. This reporter notices a longer stay at the Brazilian… or was it the Argentinian camp. Other nationalities noticed are Brits, Russians, Germans, Scots… and a few Swedes thrown in for good measure. Per steps on stage a little after 8 pm, and the crowd goes wild. Per is all smiles for the whole hour and a half. The band is in absolutely top shape, and you can hear this is a band that is having fun! While shooting photos in front of the stage during the first three songs, this reporter could hear Per's shoes banging on the floor when he does his trademark Per "dance moves." "The beautiful Cirkus-venue, a very relaxed band and crowd-pleasing setlist and… of course… a mind-blowing audience that makes life so sweet for us!" says Per. There are, as far as this reporter can tell, no changes in the setlist this evening; it goes from A to Z like a freight train, even though the band jokes and starts playing Gyllene Tider's old hit "Sommartider" after Per yelling "Did I hear 'Sommartider'??" Chris also falls into The Knack's "My Sharona" in the intro of "Do You Wanna be My Baby?" This is a great concert, the sound is more or less perfect, and it's understandable that they chose Cirkus to be the place for the video shoot. Marie Fredriksson didn't show up, but is expected to make a guest appearance this evening for the last concert. Will it be better tonight? We will definitely see. Stay tuned. And for those who wonder, the two Stockholm concerts are being shot in hi-definition. Update: Per lets us know that there won't be a Meet & Greet tonight (Sunday) since there'll be too much going on after the show. Written by Lars-Erik_Olson on May 8, 2009 to Live and Per Gessle. HALMSTAD, SWEDEN - About 2,000 tickets were sold to this evening's "homecoming" concert in Halmstad, Sweden. The show, which was held at the indoor Sporthallen, attacted a crowd from all over southern Sweden (along with the now familiar small groups of fans from other countries) eager to hear Per and his band. In Halland Posten's backstage video interview with Per (in Swedish), he states that he enjoys playing in his childhood town. "The audience is always nice and active," he says. [Editor's note: Per also comments on how people were holding their cameras and taking photos with one hand, while blowing their noses (from crying) with the other when Marie took the stage in Amsterdam.] He also told this local newspaper (see article) that the tour "has been the the must fun thing I've ever done. The intimacy that we experienced in smaller venues has in some way reminded me why I do what I do." As many of our readers already know, Per and his music are symbols of the Swedish summer, and with summer right around the corner, the Swedish crowd was ready to let loose and celebrate. After opening with "Dressed for Success," Per approached the mic and shouted out "Hello Halmstad!" The response was an explosion of cheers that reverberated in the echo-prone sports hall. Per's mother, Elizabeth, was spotted amongst those sitting in a makeshift VIP area set up behind the mixing board. Tonight's concert was, in part, a dress rehearsal for the videotaping of the DVD that will occur at the Stockholm concerts. The set list, which follows, is therefore expected to remain the same with Marie joining Per on stage — as she did in Amsterdam — for "The Look" and "It Must Have Been Love." Written by Lars-Erik_Olson on May 6, 2009 to Live, Marie Fredriksson and Per Gessle. AMSTERDAM (Updated) - There were screams, wolf whistles, shouts of "Marie!," cheers, hoots, hollers, and just about every other loud sound of jubiliation you could possibly imagine when Per Gessle invited Marie Fredriksson to join him on stage this evening. And yet, if one paused for a moment to look at the people around them, it was rather easy to spot people with tears in their eyes. It was, by all accounts, an extremely emotional moment… and many in attendance at the Melkweg Arena felt they were witnessing pop music history being made. Despite the publicity put out by Night of Proms that it will be on their stage that Roxette will reunite — and as The Daily Roxette was first to report with authority — it was here tonight before a crowd comprised of adoring fans that that reunion actually occured, and somehow that seemed especially fitting. Marie, wearing jeans and a black blouse and vest, walked onto the stage with confidence, raised her arms in the air, and acknowledged the cheering crowd. After giving Per a hug, she said "Wow!," obviously pleased with the reception she was receiving. Per went to a microphone and joked "Don't forget to bring your cameras," as a virtual sea of cameras had popped up into view. Then, in the moment of silence just before Marie was about to sing, someone near the front of the audience — a male voice — shouted "Thank you God!" Marie sang lead vocals on "It Must Have Been Love" (view mobile phone video posted by Expressen) and "The Look" (view video from same source) which surprised many fans who were expecting her to take over for Per and sing "Wish I Could Fly." There are links to better quality videos in the comments below. Update: Just prior to the concert, TDR was in touch with long-time reader "Kachina" (Sheba Argarwal-Jans). Knowing that this would be her first Roxette-related concert, we invited her to write a review, or provide us with her impressions. We're delighted with her report, and hope you'll find it interesting as well. We've also added photos shot exclusively for The Daily Roxette by staff photographer Colin van der Bel. Click here for a special TDR slideshow with more than 50 pictures of the concert! Written by Lars-Erik_Olson on May 5, 2009 to Live and Per Gessle. LONDON (Updated) - Having recovered from feeling a bit under the weather in Gent, Per Gessle was in top form Monday night when he and his band performed here at the Islington Academy in front of a very appreciative crowd. Per told The Daily Roxette after the concert that he thought it had become one of the Top 3 shows on the tour so far. Fans from Brazil — almost all of whom had flown into London just to attend this concert — made up the largest contingent of fans from outside the UK. It was easy to see their numerous green, yellow and blue flags being waved from the upper-level lounge that overlooked the stage. Having also travelled from overseas, some long-time fans from California (USA) and Canada were there as well enjoying the show along with their European counterparts. While the set list remained the same, "Hey, Mr. DJ" was moved from it's position in Gent just after the band introductions to become one of the encore songs. Many fans, still riding high on the energy from the concert, waited outside in the chilly evening temperature with the hopes that they could get a glimpse of Per and other band members as they made their exit from the venue. A "meet & greet" was not possible, they had been told, because the venue had a private party scheduled for after the concert. However, after other band members had been outside for some time signing autographs, tour director Bo Johansson made an appearance to say, in very strong terms, that IF fans were willing to get in a single-file and ask for only one autograph — and not stop to take any "personal photos" — that he would bring Per out. Concerned that Per — who had just recovered — not get sick again, he also said "no kissing or hugging or anything like that." Written by Lars-Erik_Olson on May 4, 2009 to Exclusive, Live and Roxette. LONDON (Updated) - No longer just the dream of die-hard fans around the world who will surely feel their prayers for Marie's recovery were answered: Roxette are back! The Daily Roxette has learned that Marie Fredriksson will be joining Per Gessle on stage at the “Party Crasher” concert in Amsterdam on Wednesday. For several days now, fans have told TDR that people affiliated with the tour have told them to expect a “surprise” at that concert. Since Per has already said he expected Marie might join him on stage for one or two of his tour dates, fans who heard about this upcoming surprise immediately surmised that it meant that Marie would be making an appearance. This indeed will be the case. There, in Amsterdam, in front of one of the largest expected audiences on this tour… fans in attendance will be able to witness first-hand the long awaited, highly anticipated return of Roxette to the stage when Per proudly announces he has a special guest. But the real evidence of Roxette's return is that tomorrow afternoon shortly after 5 pm, at an official Night of the Proms press conference in Belgium, they will announce that Marie has recovered from the illness that forced them to cancel their scheduled appearance in 2002. Seven years later, Roxette will finally make good on that previous commitment and perform at this year’s series of concerts to be held in Belgium, Germany and the Netherlands beginning at the end of October and running through December. Written by colinvdbel on May 4, 2009 to Editorial, Live and Per Gessle. EDITOR'S NOTE: TDR reporter Colin van der Bel files this additional account and review of the Party Crasher concert in Gent, Belgium. Update: Click here for a special TDR slideshow with more than 100 pictures of the concert! GENT, Belgium — It was a cloudy afternoon in Holland as this reporter began the drive down to Belgium to see Mr. G and his Heavy Metal Kids live in Gent's Handelsbeurs music venue later that night. When I arrived, a large group of fans had already assembled and were pretty excited when Clarence and Pelle made a brief appearance. The show wasn't sold out completely, but surely the enthusiastic fans would made up for that! The show started with support-act Martinique, who performed (singing, playing the guitar and even doing the elecric-boogie) a number of his songs. Also worth noting is that, in my opinion, the selection of music played before the show and during the intermission was excellent! 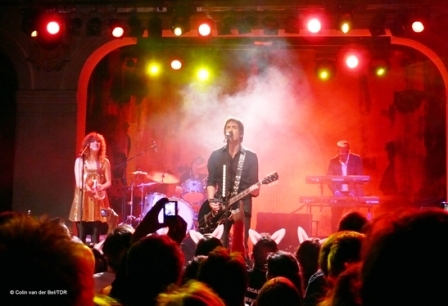 Written by Lars-Erik_Olson on May 3, 2009 to Fans, Live and Per Gessle. GENT, BELGIUM - Per Gessle had a doorbuster of a concert here in Gent last night. And we mean that literally. Leaving the venue at the end of the concert, this reporter asked one of the staff members who work at Handelsbeurs, a young man named Andreas whom we had met two days before, what he thought of the concert. “It was good,” he said somewhat hesitantly. “Well, the concert was good, but his fans are CRAZY! They broke our door! !” Apparently, that had never happened before. For several hours, fans from around the world had waited patiently outside Handlesburs, waiting for the doors to open at 7 pm. It was a festive atmosphere, with a mix of fans from countries including Spain, Russia, Holland, Germany, Romania – Belgium of course – and even small groups from as far away as Argentina and Mexico. Many had taken advantage of the three-day holiday weekend to attend this particular concert. At one point, the house manager came outside to tell the waiting fans that there would be plenty of room inside, and that everyone would have a good view (the venue can hold up to 800, and only around 280 tickets had been sold). But, of course, many in the assembled crowd had hopes of being in the “front row.” So when the big, strong, wooden outside doors opened inward, there was a mad rush to get inside. The actual concert hall was still closed, however. The idea of course was to give the venue a chance to sell drinks in the lounge area. Not interested in “lounging,” the small mob outside quickly became a small mob inside, and when they finally were ready to open these much more fragile wooden frame doors, they needed to be opened outwards. It was difficult for the staff to get people intent on proceeding forward to move backwards, so when they did manage to get one door open, there was enough pressure placed on the other door as it was opening to cause the unmistakable sound of cracking wood to be heard throughout the lounge. Seriously, it was an accident. Per's "crazy" fans had a lot of fun during the concert*, and were by all accounts very well-behaved afterwards, waiting this time in an orderly line as Bo Johansson, the tour manager, ushered everyone waiting past Per, who was willing signing autographs and posing for quick photos. Written by Lars-Erik_Olson on April 24, 2009 to Live and Marie Fredriksson. STOCKHOLM - Marie will be one of the celebrity guests attending a June 18 gala at Stadshuset (Stockholm City Hall) where Crown Princess Victoria will be handing out this year's prizes from the Marianne and Sigvard Bernadotte Artist Fund. The gala is even more special this year as Marianne Bernadotte, who is Victoria's great aunt, is celebrating her 85th birthday. Marie is expected to perform during the event, along with Marianne Bernadotte's close friend Lill Lindfors, opera singer Barbara Hendricks with Staffan Scheja, and violinist Christian Svarfvar. Other special guests announced at this morning's press event, held at the Grand Hôtel, include ABBA singer Agnetha Fältskog, but it is uncertain for now whether she too will perform. Written by Kerstin on April 18, 2009 to Live and Per Gessle. Per is doing a signing session at Saturn in Hamburg Altstadt next Saturday. It will start at 15:00 and will last for about an hour. More info, in German, can be found at Saturn's website.